This How-To covers how to set up Control to automatically send an email to your customer when the order is changed to a status of Built. 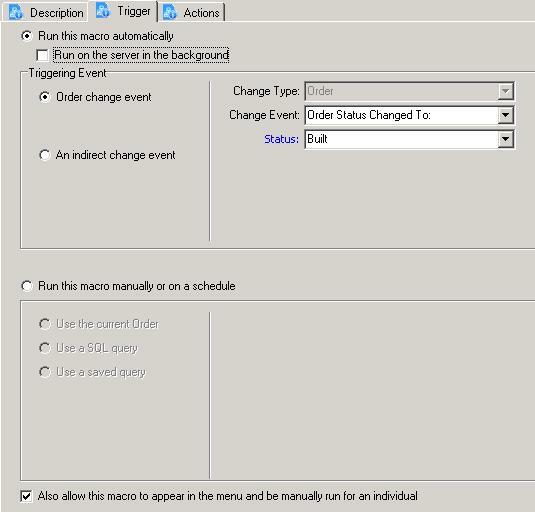 Creating a macro is split up into 3 main parts, creating the macro and configuring the Description, the Trigger, and the Actions. Click on Marketing Home on the main Toolbar. Click on Macro Setup. This will open the Macro Setup Window. Click on Order Macros in the left panel. Click on New Macro at the top of the left panel. Enter Email Order Marked Built as the Macro Name on the Description tab. At least for testing, we want to run this macro on the machine you are using. Uncheck the box Run on the server in the background. If you later want to change this please verify your email settings under Setup | System Setup are set to Internal with the proper mail server settings. If you do not set this settings correctly all emails will fail to send. Choose an Order change event as the triggering event. Choose an Order Status Changed To: from the drop-down as the Change Event. Choose Built from the Status drop-down. If you want to be able to run this macro manually on an order from within the Order Explorer, check the Allow this macro to appear in the menu and be manually run for an individual order checkbox. The macro tab automatically starts with two pop-up message prompts. Leave the message prompts in initially, though experience tells us you may find them annoying after a while in which case edit this macro delete them at that time. 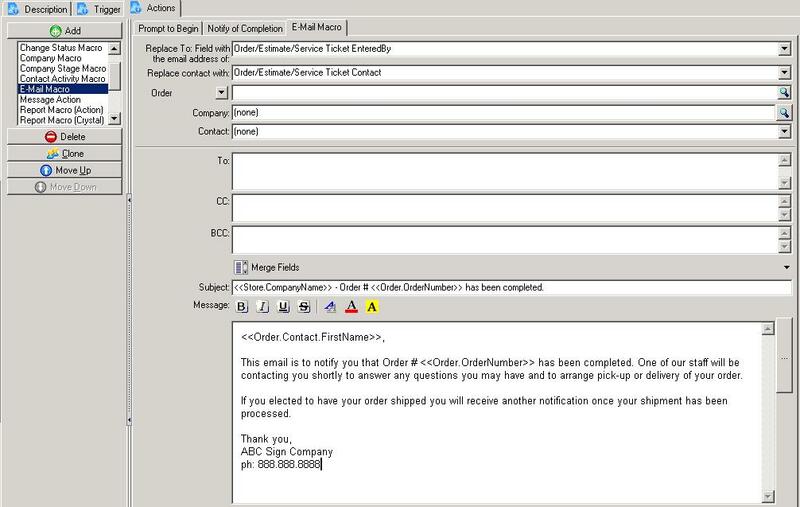 This macro will automatically email customers when an Order is changed to the status of Built. Check the box “Allow user to cancel macro execution with this message” so they user will have an OK & Cancel buttons and not just an OK button. Click on the Notify on Completion macro action tab. Type a message such as: Done! Add an action to send the email. In the center panel is a list of macro actions, click on E-Mail Macro and click the Add button above it. This will add a new action on the right. Set this option to the **Order/Estimate/Service Ticket Contact**. This may change if instead you wish to email the salesperson or the person that entered the order. Modify the subject to your liking, be sure to use merge fields where appropriate. Optional: Click on the Prompt to Begin macro action and click the Delete button to remove it. Optional: Click on the Notify of Completion macro action and click the Delete button to remove it. Save the Macro by clicking Save on the right-side action toolbar. 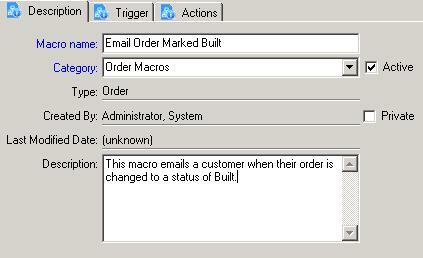 The macro is setup to automatically email the customer when the order is changed to a status of Built.